From Chemicals to High Pressure. 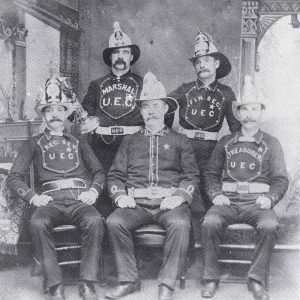 Vintage Fire Crew with Fire Chief at centre. In the early 1900’s rubber-lined duck coats and rubber boots became universal and were considered more practical for firefighting in Canadian climates. The colour of the gear slowly changed from the all black coats to something more visible. With the invention of the internal combustion engine in the late 19th century, horse-drawn steam engines were gradually replaced; first with self-propelled steam powered units, later with gasoline powered trucks. Primitive breathing apparatus being demonstrated. Scientific researchers began looking into the hazardous atmospheres firefighters are exposed to when fighting fires. Because a multitude of new chemicals and plastics were continually being introduced to the construction industry, increasingly dangerous emissions were being produced when these materials burned. Breathing apparatus was first introduced as a means for getting oxygen to firefighters entering a burning building. Early devices required hand pumping by firefighters stationed outside. But as awareness of poisonous toxins became more widespread continuously improved automated and self contained breathing apparatus, which not only supplied air but kept harmful gases out, was perfected. Soon it was required for every firefighter entering or working near a burning building. 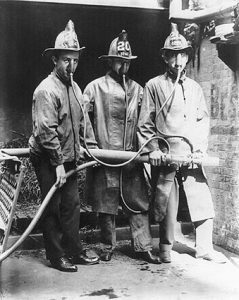 Today’s firefighters look quite different than those of a century ago! Today — Today part-time and professional firefighters are aware of the many hazards of their jobs and how to reduce them. Sound safety practices and sophisticated technology helps them as they respond to emergency situations that no one else can or, will handle. 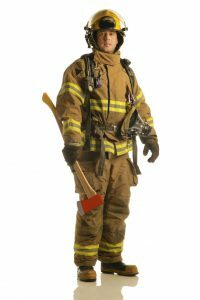 The Museum has a large collection of firefighter protective gear and clothing.